This article is a condensed version taken from Floyd Gibbons - Your Headline Hunter, a biography by his brother, Edward Gibbons. The biography was published by the Exposition Press, New York, 1953. It is reproduced here with permission. Floyd's account of being wounded at Belleau Wood was never published as a newspaper article - it was taken from his private journals. 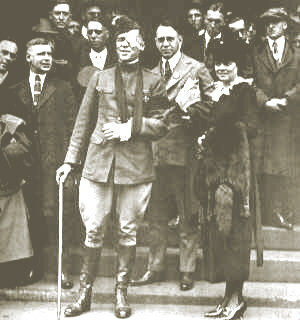 5-Oct-1918: Floyd is given a "home town" welcome at Minneapolis, MN. On Gibbons' left is sister Zelda. On June 6, 1918, Floyd Gibbons, war correspondent for the Chicago Tribune, and Lieutenant Oscar Hartzel of the Intelligence Division entered Belleau Wood. 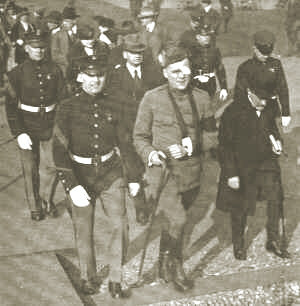 There they met Major Benjamin S. Berry, battalion commander of the Fifth Marine Corps. Berry advised them to go back, as it was "hotter than hell" just ahead, but relented with the admonition that they were coming at their own risk. Gibbons and Hartzel found themselves in the midst of one of the roughest and toughest battles of the entire war. The French were so impressed with the heroic fighting abilities of the Marines, and the nullifying of the German threat to actually march on and capture Paris, that they renamed the area Bois de la Brigade des Marines - "the Woods of the Brigade of Marines". 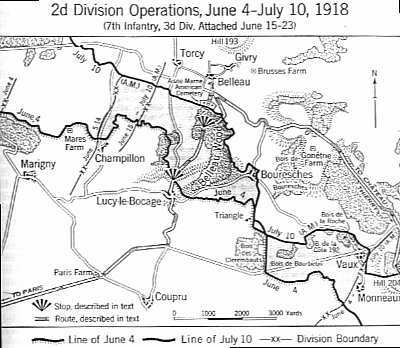 Belleau Wood, west of the town of Lucy-le-Bocage, was not one solid mass of forest, but made up of many one- to five-acre patches of woods with oat and wheat fields in between. The advance of the Marines was so rapid and over such rough terrain that the men had only machine guns, their carbines with bayonets attached, hand grenades, and side arms for the officers. Although the heavy artillary in the rear was within range of the front, the speed with which the Marines were rolling forward prohibited the use of heavy shelling. The Fifth Marine Corps was poised on the edge of a V shaped oatfield, bordered on all sides by thick woodland. According to the international rules of war, Floyd Gibbons, a noncombatant, could carry no arms. He was armed with his notebook and pencil. Berry gave the order to advance, stepping out first himself, with each man following at ten to fifteen yard intervals. Floyd was next in line to Berry, with Hartzell next to Floyd. 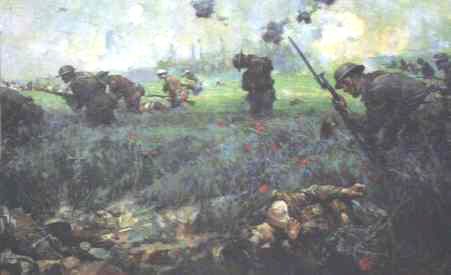 As they reached the middle of the field German machine-gunners a hundred yards on their left, opened up. Berry ordered everybody down, and they flattened themselves in the young oats as best they could. Floyd looked up to see Major Berry, his right hand holding the stump of what had been his left hand, still standing. Floyd yelled to him to get down, and started inching towards him. Trying to hide his movement from the German machine-gunners, Floyd crawled along, his left cheek hugging the ground and his helmut pushed over the right, partly covering his face on that side. Floyd had gotten but a few feet when a bullet hit him in the left arm, just above the elbow, going in one side and out the other. He continued to push himself forward. A few moments later another bullet hit him in the left shoulder blade, still he inched on. Another five feet along, a third bullet hit him, it ricocheted off a rock in the ground, and with an upward course ripped out his left eye, continued on, making a compound fracture of the skull, and finally coming out on the right side of his helmet where it blew a hole three inches long. Remarkabley Floyd did not lose consciousness, he was dazed, and experienced a sensation of a lot of glass crashing around him, everything turning white in his mind's eye. His eyeball was lying on his cheek split in half. His left hand and arm were numb and out of commission. He wondered if he was dead, and pinching himself for reassurance, concluded he was still alive. Movement in any direction was now impossible. A mortally wounded Marine near him lay thrashing about, bringing machine-gun spray just inches from Floyd. Floyd watched the bullets rip apart the young man's body, buttons and parts of his uniform flying off, 'til finally he lay still. A short time later Floyd looked up to see Major Berry jump to his feet, and in a hail of bullets, get back into the woods. Floyd later learned the major was able to get word back to a light artillary unit, enabling the unit to wipe out the German machine-gun nest holding up the advance. For his supreme effort, General Pershing decorated Major Berry with the Distinguished Service Cross. Hartzell called to Floyd in a low voice, asking Floyd how he was. Hartzell was unaware of Floyd's condition before now. When he asked Floyd if he was badly hurt, Floyd said "No, I don't think so." Hartzell said "Well, where are you hit?" "You damn fool, you say you're not hurt badly. I'm coming right over to help you." "You damn fool, if you do any moving, don't move in my direction. I think they think I'm dead." They decided to give the addresses of their wives to each other in case they didn't get through alive. Another thing was bothering Floyd, the fear of gas gangrene poisoning. He had seen many terrible cases among our soliders, it was easily contracted from lying out on cultivated and fertilized farm land. To try to reduce the possibility, he had placed his two-inch thick British gas mask up under his cheek, keeping his face off the ground. Then, realizing his French mask was only half an inch thick, he replaced it with that. With the machine-gun bullets whizzing right over his head, ten to twelve inches off the ground, that extra inch and a half gave him considerable consolation. Since it was the 6th of June, it did not get dark until 9:00pm. Floyd had been hit at 6:00pm. They lay out there for 3 hours before they dared to move. Every fifteen minutes Hartzell would tell Floyd what time it was and try to cheer him up, telling him it would soon be dark. Finally Hartzell was able to inch his way over to Floyd. Floyd, anxious to know the extent of his injuries, looked at Hartzell. He was met with a look of horror; his eyeball was hanging down by the nerves, completely out of the socket, his skull had a deep furrow across it, his face and hair were covered in blood and his left sleeve was likewise drenched. He later learned had the bullet that hit his eye gone a sixteenth of an inch deeper, it would have killed him instantly. Floyd was quite weak from lose of blood, and once they had crawled back to the woods, Hartzell had to support Floyd. They finally came to a road and started walking slowly down it in search of a first aid station, but without any idea of where there was one. The following is Floyd's account of the complications encountered on his way to the base hospital and his reaction to undergoing a major operation. 28-Sep-1918: Approaching General Logan's statue in Chicago's Grant Park for the presentation of the Croix de Guerre with Palm. Behind Gibbons is Illinois Lieutenant Govenor John G. Oglesby, behind Oglesby is Gibbons' sister Margaret. On Gibbons' left is the French consul at Chicago, Antonin Barthelemy. Weakness from the loss of blood started to grow on me as Lieutenant Hartzell and I made our way through the deepening shadows of the wooded hillside in the rear of the field on which I had been shot. In an upright position of walking, the pains in my head seemed to increase. We stopped for a minute and, neither of us having a first-aid kit with us, I resurrected a somewhat soiled silk hankerchief with which Hartzell bound up my head in a manner that applied supporting pressure over my left eye and brought a degree of relief. Hartzell told me later that I was staggering slightly when we reached a small relief dugout about a mile back of the wood. There a medical corps man removed the handkerchief and bound my head with a white gauze bandage. I was anxious to have the wound cleaned but he told me there was no water. He said they had been forced to turn it over to the men to drink. This seemed to me to be as it should be, because my thirst was terrific, yet there was no water left. We stumbled rearward another mile and, in the darkness, came upon the edge of another wooded area. A considerable number of our wounded were lying on stretchers on the ground. The Germans were keeping up a continual fire of shrapnel and high-explosive shell in the woods, apparently to prevent the mobilization of the reserves, but the doctors, taking care of the wounded, proceeded with their work without notice to the whine of the shells passing overhead or the bursting of those landing nearby. They went at their work just as though they were caring for injured men on a football field. Hartzell stretched me out on the ground and soon had a doctor bending over me. The doctor removed the eye bandage, took one look at what was beneath it and then replaced it. I remember this distinctly because at the time I made the mental note that the doctor apparently considered my head wound beyond anything he could repair. He next turned his attention to my arm and shoulder. He inserted his scissors into my sleeve at the wrist and ripped it up to the shoulder. He followed this operation by cutting through my heavy khaki tunic from the shoulder to the collar. A few more snips of the nickle-plated blades and my shirt and my undershirt were cut away. He located the three bullet holes, two in the arm and one across the top of the shoulder, and bound them up with bandages. "We're awful shy of ambulances," he said. "You will have to lie here awhile." "I feel I can walk alright if there is no reason I shouldn't," I replied. "You ought to be in an ambulance," said the doctor, "but if you feel that you can make it, you might take a try at it." Then turning to Lieutenant Hartzell, he said, "Keep right with him, and if he begins to get groggy, make him lie down." So Hartzell and I resumed our rearward plodding or staggering. He walked at my right side and slightly in front of me, holding my right arm over his right shoulder and thereby giving me considerable support. We had not proceeded far before we heard the racing motor of an automobile coming from behind us. An occasional shell was dropping along the road we were now on. A stick struck my legs from behind in the darkness. And then an apologetic voice said: "Beg your pardon, sir; just feeling along the road for shell holes. Ambulance right behind me, sir. Would you mind stepping to one side? Come on, Bill," to the driver of the ambulance, "it looks all clear through here." The automobile wIth the racing engine turned out to be a light Ford ambulance. Its speeding engine was pure camouflage for its slow progress. It bubbled and steamed at the radiator cap as it pushed along at almost a snail's pace. "All full?" Hartzell shouted into the darkness of the driver's seat. "To the brim," responded the driver. "Are you wounded?" "No, but I have a wounded man with me," said Hartzell. "He can sit beside you on the seat if you have room." "Get right in," said the driver, and Hartzell boosted me into the front seat. We pushed along slowly, Hartzell walking beside the car and the driver's assistant proceeding ahead of us searching the dark road with his cane for new shell crators. Occasionally, when our wheels would strike in one of these, groans would come up from the ambulance proper. "Take it easy," would come a voice through pain-pressed lips: "for Christ's sake, do you think you are driving a truck?" I heard the driver tell that he had three men with bullet-splintered legs in the ambulance. Every jolt of the car caused their broken bones to jolt and increased the pounding of their wearied nerves to an extremity of agony. The fourth occupant of the ambulance, he said, had been shot through the lungs. Some distance along, there came a knock on the wooden partiton that seperates the driver's seat from the ambulance proper. The car stopped and the driver and Hartzell went to the rear door and opened it. The man with the shot through the lungs was half sitting up on his stretcher. He had one hand to his mouth and lips, as revealed in the rays of the driver's flashlight, were red wet. "Quick-get me-to a doctor," the man said between gulps and gurgles. The driver considered. He knew we were ten miles from the closest doctor. Then he addressed himself to the other three stretcher cases - the men with the torture-torn legs. "If I go fast, you guys are going to suffer the agonies of hell," he said, "and if I go slow this guy with the hemorrhage will croak before we get there. How do you want me to drive?" There was not a minute's silence. The three broken-leg cases responded almost in unison. "Go as fast as you can," they said. And we did. With Hartzell riding the running board beside me and the crater finder clinging to the mud guards on the other side, we sped through the darkness regardless of the ruts and the shell holes. The jolting was severe but never once did there come another complaint from the occupants of the ambulance. In this manner did we arrive in time at the first medical clearing station. I learned later that the life of the man with the hemorrhage was saved. The clearing station was located in an old church on the outskirts of a little village. Four times during this war the flow and ebb of battle had passed about this old edifice. Hartzell half carried me off the ambulance seat and into the church. As I felt my feet scrape on the flagstoned flooring underneath the Gothic entrance arch, I opened my right eye for a painful survey of the interior. The walls, gray with age, appeared yellow in the light of the candles and lanterns that were used for illumination. Blankets and bits of canvas and carpet had been tacked over the apertures where once stained-glass windows and huge oaken doors had been. These precautions were necessary to prevent the light from shining outside the building and betraying our location to the hospital-loving eyes of the German bombing planes whose motors we could hear even at that minute, humming in the black sky above us. Our American wounded were lying on stretchers all over the floor. Near the door, where I had entered, a number of pews had been pushed to one side and on these our walking wounded were seated. They were smoking cigarettes and talking and passing observations on every fresh case that came through the door. They all seemed to be looking at me. My appearance must have been sufficient to have shocked them. I was hatless and my hair was matted with blood. The red-stained bandage around my forehead and extending down my left cheek did not hide the rest of my face, which was unwashed, and consquently red with blood. "My God, look what they're bringing in." "Would you like a cigarette, old man?" "Yes," I replied. He lighted one in his own lips and placed it in my mouth. I wanted to know my benefactor. I asked him for his name and organization. "I am not a soldier," he said; "I am a non-combatant, the same as you. My name is Slater and I'm from the Y.M.C.A." That cigarette tasted mighty good. If you who read this are one of those whose contributions to the Y.M.C.A. made that distribution posssible, I wish to herewith express to you my gratefulness and the gratefulness of the other men who enjoyed your generousity that night. In front of what had been the altar in the church, there had been erected a rudely constructed operation table. This table was surrounded with tall candelabra of brass and gilded wood. These ornate accessories had been removed from the altar for the purose of providing better light for the surgeons who busied themselves about the table in their long gowns of white-stained red. I was placed on that table for an examination and I heard a peculiar converstion going on about me. One doctor said, "We haven't any more of it." Then another doctor said, "But I thought we had plenty." The first replied, "Yes, but we didn't expect so many wounded. We have used up all we had." Then the second voice said: "Well, we certainly need it now. I don't know what we are going to do without it." "It's all right now; we've got plenty of it We've got just piles of it. The Red Cross just rushed it out from Paris in limousines." After the injection Hartzell informed me that the doctors could do nothing for me at that place and that I was to be moved further to the rear. He said ambulances were scrace but he had found a place for me in a returning ammunition truck. I was carried out of the church and somewhere in the outer darkness was lifted up into the body of the truck and laid down on some sraw in the bottom. There were some fifteen or twenty other men lying there beside me. "Well, if you can't make it easier by going slow, then for God's sake throw her into high and go as fast as you can. Let's get it over with as quick as we can." Lying on my back in the truck with a raincoat as a pillow, I began to wonder where we were bound for. I opened my eye once and looked up toward the roof of the leafy tunnel which covered the road. Soon we passed out frim beneath the trees bordering the roadside and I could see the sky above. The moon was out and there were lots of stars. They gave one something to think about. After all, how insignificant was one little life. Sometime during the dark hours of the early morning we stopped in the courtyard of a hospital and I was taken into another examination room illuminated with painfully brilliant lights. I was placed on a table for an examination, which seemed rather hurried, and then the table was rolled away some distance down a corridor. I never understood that move until some weeks later when a lieutenant medical officer told me that it was he who had examined me at that place. "You're looking pretty fit, now," he said, "but that night when I saw you I ticketed you for the bone pile. You didn't look like you could live till morning." His statement gave me some satisfaction. There is always joy in fooling the doctor. Hartzell, who still accompanied me, apparently rescued me from the "bone pile" and we started on another motor trip, this time on a stretcher in a large, easier-riding ambulance. In this manner I arrived shortly after dawn at the United States Military Base Hospital No. 1 at Neuilly-sur-Seine, on the outskirts of Paris. There were more hurried examinations and soon I was rolled down a corridor on a wheeled table, into an elevator that started upward. Then the wheeled table raced down another long corridor and I began to feel that my journeyings were endless. We stopped finally in a room where I distinctly caught the odor of ether. Someone began removing my boots and clothes. As that someone worked he talked to me. "I know you, Mr. Gibbons," he said "I'm from Chicago also. I am Sergeant Stephen Hayes. I used to go to Hyde Park High School. We're going to fix you up right away." I learned from Hayes that I was lying in a room adjoining the operating chamber and was being prepared for the operating table. Some information concerning the extent of my injuries and the purpose of the operation would have been comforting and would have relieved the sensation of utter, helpless childnishness that I was experiencing. I knew I was about to go under the influence of the anesthetic and that something was going to be done to me. I had every confidence that whatever was done would be for the best but it was perfectly natural that I should be curious about it. Was the operation to be a serious one or a minor one? Would they have to remove my eye? Would they have to operate on my skull? How about my arm? Would there be an amputation? How about the other eye? Would I ever see again? It must be remembered that in spite of all the examinations I had not been informed and consequently had no knowledge concerning the extent of my injuries. The only information I had received had been included in vague remarks intended as soothing, such as "You're all right, old man"; "You'll pull through fine"; "You're coming along nicely." But all of it had seemed too professionally optimistic to satisfy me and my doubts still remained. "Son, I am going to operate on you. I have examined you and you are all right. You are going to come through fine. Don't worry about anything." "Thank you, very much," I said. "I like your voice. It sounds like my father's. Will you tell me your name?" "I am Major Powers," the kindly voice said. "Now just take it easy, and I will talk to you again in a couple of hours when you feel better." The speaker, as I learned later, was Major Charles Powers, of Denver, Colorado, one of the best-known and best-loved surgeons in the West. A man far advanced in his profession and well advanced in his years, a man who, upon America's entry of the war, sacrificed the safety of the beneficial air rarity of his native Denver to answer the country's call, to go to France at great personal risk to his health - a risk only appreciated by those who knew him well. It was Major Powers who operated upon the compound fracture in my skull that morning. My mental note-taking continued as the anesthetist worked over me with the ether. As I began breathing the fumes, I remember, my senses were keenly making observations on every sensation I experienced. The thought even went through my mind that it would be rather an unusual thing to report completely the impressions of coma. This suggestion became a determination and I became keyed up to eveything going on aobut me. The conversation of the young doctor who was administering the anesthetic interested me unusually. He was very busy and business-like, and although I considered myself an important and most interested party in the entire proceedings, his conversation ignored me entirely. He not only did not talk to me, but he was not even talking about me. As he continued to apply the ether, he kept up a running fire of entirely extraneous remarks with some other person near the table. I did not appreciate then, as I do now, that I was only one of very, very many that he had anesthetized that morning and the night before, but at the time his seeming lack of all interest in me as me piqued me considerably. "Are you feeling my pulse?" I said. I could not feel his hand on either of my wrists, but I asked the question principally to inject myself into the conversation in some way or other, preferably in some way that would call him to account, as I had by this time aroused within me a keen and healthy dislike for this busy little worker whom I could not see but who stood over me and carried on conversations with other people to my utter and complete exclusion. And all the time he was engaged in feeding me the fumes that I knew would soon steal away my senses. "Now, never mind about your pulse," he replied somewhat peevishly. "I'm taking care of this." It seemed to me from the tone of his voice that he implied I was talking about something that was none of my business, and I had the distinct conviction that if the proceedings were anybody's business, they were certainly mine. "You will pardon me for manifesting a mild interest in what you are doing to me," I said, "but you see, I know that something is going to be done to my left eye and inasmuch as that is the only eye I've got on that side, I can't help but be concerned." "Now you just forget it and take deep breaths, and say, Charlie, did you see that case over in Ward 62? That was a wonderful case. The bullet hit the man in the head and they took the lead out of his stomach. He's got the bullet on the table beside him now. Talk about bullet-eaters - believe me, those Marines sure are." I hurled myself back into the conversation. "I'll take deep breaths if you'll loosen the straps over my chest," I said, getting madder each minute. "How can I take a full breath when you've got my lungs strapped down?" "Well, how's that?" responded the conversational anesthetist, as he loosened one of the straps. "Now, take one breath of fresh air - one deep, long breath, now." I turned my head to one side to escape the fumes from the stifling towel over my face and made a frenzied gulp for fresh air. As I did so, one large drop of ether fell on the table right in front of my nose and the deep, long breath I got had very little air in it. I felt I had been tricked. "All right, he's under now: where's the next one?" "The hell I am," I responded hastily, as visions of knives and saws and gimlets and brain chisels went through my mind. I had no intention or desire of being conscious when the carpenters and plumbers started to work on me. I was completely ignored and the table started moving. We rolled across the floor and there commenced a clicking under the back of my head, not unlike the sound made when the barber lowers or elevates the headrest of his chair. The table rolled seemingly a long distance down a long corridor and then came to the top of a slanting runway. As I started riding the table down the runway I began to see that I was descending an inclined tube which seemed to be filled with yellow vapor. Some distance down, the table slowed up and we came to a stop in front of a circular bulkhead in the tunnel. There was a door in the center of the bulkhead and in the center of the door there was a small wicket window which opened and two grotesquely smiling eyes peered at me. Those eyes inspected me from head to foot and then, apparently satisfied, they twinkled and the wicket closed with a snap. Then the door opened and out stepped a quaint and curious figure with knarled limbs and arms and a peculiar misshapen head, completely covered with a short growth of black hair. I laughed outright, laughed hilariously. I recognized the man. The last time I had seen him was when he stepped out of a gas tank on the eighteenth floor of an office building in Chicago where I was reclining at the time in a dentist chair. He was the little gas demon who walked me through the Elysian Fields last time I had a tooth pulled.
" Well, you poor little son-of-a-gun," I said, by way of greeting. "What are you doing in France? I haven't seen you for almost two years, since that day back in Chicago." The gas demon rolled his head from one side to the other and smiled, but I can't remember what he said. My mental note-taking concluded about there, because the next memory I have is of complete darkness, and lying on my back in a cramped position while a horse trampled my left arm. "Back off there!" I shouted, but the animal's hoofs didn't move. The only effect my shouting had was to bring a soft hand into my right one, and a sweet voice close beside me. "You're all right, now," said the sweet voice: "just try to take a little nap and you'll feel better." "What place is this, and will you please tell me what day and time it is?" "This is the Military Base Hospital No.1 at Neuilly-sur-Seine just on the outskirts of Paris, and it is about eleven o'clock in the morning and today is Friday, June the seventh." Then I went back to sleep with an etherized tasted in my mouth like a motorman's glove. 28-Sep-1918: Floyd's mother pins her son with the Croix de Guerre with palm. Between them is his father. 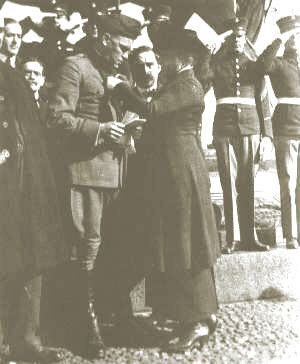 August, 1918 - Floyd was given France's greatest honor, the Croix de Guerre with Palm, for valor on the field of battle. June 21, 1941, Marine Corps League State Commandant Roland L. Young gave a posthumous award of a gold medal, making Floyd an honorary member of the Marine Corps. It was the first such civilian honor ever made in the history of the Marine Corps Leauge, and was given in recogniton of Floyd's close association and valorous action while in Belleau Wood. Upon arrival at the front the morning of June 6, 1918, Floyd sent his staff car back with a dispatch to take to the censor's office. It read "I am up at the front and entering Belleau Wood with the U.S. Marines." He actually expected the censor to delete the last part, up to that time no correspondent on any Allied front had been permitted to say what troops were on what fronts. Before the staff car driver reached the censor's office, in some way word had reached them that Floyd had been wounded and the report was that he was dying. When the censor came to Floyd's dispatch he said "Well, it would be a crime to cut Gibbons' last dispatch, so we will let it go as is." Since the censor let Floyd's through, all the correspondents were given the same privilege. For three days the news traveled like wild fire through the United States that the U.S. Marines were fighting it out with the Germans in Belleau Wood. At the end of the third day the censorship was clamped on again. 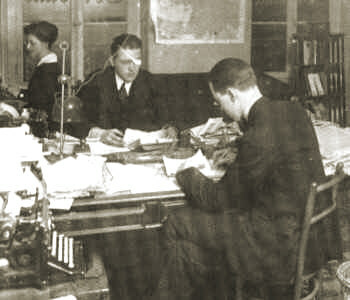 Floyd at his desk at the the Chicago Tribune shortly after the war.